I have been sneezing since I woke up this morning. Or, worse yet, been on the verge of a sneeze. You know, the annoying tickle starts in your nose, then your face scrunches up, aaaahhhh......... nothing. Not even a little wimpy one. Some cultures have considered sneezing as a sign of good fortune whereas others have seen it as an omen of death. The saying "God Bless You" is thought to have arisen during the Bubonic Plague of the 6th century, where sneezing was one of its early symptoms. The world record for sneezing is held by Donna Griffiths from Worstershire in the UK, who sneezed for 978 days in a row, stopping on 16 September 1983 (Guiness world records)just shoot me now. By the way, your heart doesn't stop, nor does your soul get expelled, nor will your eyes pop out if you try to keep them open, when you sneeze. 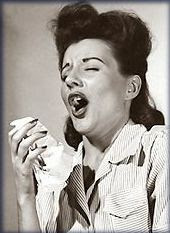 There needs to be a word for this almost-sneezing phenomenon...which drives me nuts, too! In the meantime, feel better. Or, if your sneezes are caused by sunshine, I hope you feel terrible soon. And I mean that in the best possible way :-). As for me, I can't wait to be sneezing because my annual nasal cacaphony means just one thing: SPRING! You can rupture an eardrum though. The added pressure from holding a sneeze in is very powerful and can affect your hearing. Have you ever held an exceptionally big sneeze in and then heard a ringing in your ears? See! You can throw your back out. I've done that when a sneeze has caught me off guard and I've been slightly twisted. I've found that I have that almost sneeze thingy more often as I get older. What's up with that anyway?